Intergalactic travel relies on an intricate system of Gates that interconnect all inhabitable planets. These Gates were built in the far-distant past by an extinct race called the Krell and the methods for their construction has been long since forgotten. Web Gates will only open when the pathways are clear. That is to say, when there is no planetary body, star, or other obstruction blocking a path. Gates may be opened by anyone with an affinity for the Web Way, but are only truly opened safely by those trained as Web Guides. Web Guides are people who are attuned to the flow of the Warp and can see when and where the Gate leads and opens, as well as mentally process the mathematical equation of how long a path can be maintained and the time it will take to travel from one gate to another. This is called Astrogation. Most Web Guides are Meurlain. Fringer and Tribe Web Guides are rare, but not unknown. The people of the Imperium of Man were seemingly unable to attune to the Web Way until around the time of the defeat of the Thinking Machines; making them almost totally reliant on the Meurlain to move them from planet to planet before then. When a Guide opens a Web Way, he touches the Gate itself and then enters a meditative state where he sees the path laid out before him. If a path exists, and the Way is clear, the Guide may then see the multiple Gates or far points that the Gate may lead to. Some gates lead only to places called Way Points. Way Points are hubs that lead to other locations, and are a static “safe place” within the Web Ways. When a Gate is opened, a Guide may hold the Gate open as long as he maintains physical contact and concentration. He may then allow others people or objects to pass through before choosing to close the Gate or step through after them. Moving into or out of the Web Way is called “Transitioning” and is highly dangerous. The danger lies in an effect that is called the “Ephris.” The Ephris is when a person becomes lost between the dimensions, usually never to be seen again. When moving between, there is a brief moment of semi-consciousness and delirium as one is literally thrust between dimensions. This effect passes rapidly, and after many Transitions becomes easier to handle. Many first timers find themselves physically ill, and some never truly get used to the effect on their body. This was a common malady among Imperials, who refered to it as Web Sickness before the war with the Thinking Machines. If the Transition is successful, the object or person usually appears on a lighted, ephemeral path that stretches on invisibly into a swirling miasma of darkness. There are no walls or ceiling. However, the Web Way Paths can change without notice, and there are reports of the Path being completely shrouded in darkness or filled with blinding white light. The Way Point or destination Gate can be seen in the distance, appearing as an opening filled with light. It is important to have a trained Web Guide once you are inside the Web Ways. Much like a spider web, there are multiple intersections and branches leading off in a myriad number of directions, making it very easy to become lost as Way Points change and shift between possible Paths. The Way Points are large domed areas roughly one-thousand feet in circumference made of a strange, shifting, metallic substance that continually opens and closes entries to Paths as they become available. They are the only truly stable thing within the Web Ways. When traveling between worlds, a person must physically travel the Paths. The time a Path will be open can vary greatly depending on the position of stellar bodies. A properly trained Guide can run the mathematical equation in his head and estimate the time to within seconds of actual travel time. This is important because if a Path is closed or becomes blocked by a stellar body all who are upon it will vanish, lost to the Epherium forever. The use of vehicles to transport people and goods inside the Web Way is unheard of now, but back in Origo it wasn’t that uncommon. It did not change the time traveled in any way however. So to travel from Akeir to Jord always took so many hours whether on foot or on train. All a vehicle did was allow a large amount of goods to be moved easily. This was limited by the Gate class of the planet that the vehicle was traveling towards. Large vehicles only traveled between MK.I gates. There were once even specialized military vehicles that had even been designed to exit both MK.I and MK.II gates. MK.III gates were simply so small, it was rare to see any vehicles that could pass through other than small single-man transports and powered wheel barrows with trailers for goods. To open a Gate without a Path is to open a doorway into nothingness. It is said that in such places many dark things crawl. It is a place of oblivion, and legend affords it an almost evil intelligence. When a person or object is taken by the Ephris, they are lost in the Epherium. The types of transportation planet-side back in Origo were legion, ranging from gas-filled airships and high-tech fighters to domesticated animals and land trains. The tech level between worlds varied so greatly that there was no real standard. Mysteriously, vehicles on Eclipse are another story, as any attempt to use standard combustion or reactor-based engines has failed. Something always seems to infest and corrode the transmission systems of larger equipment, rendering them useless in a matter of hours. It was cause for much frustration in the beginning years of exploration and the construction of base camps. However, Yazata tech from Elder’s Grove seems to be on to something. Though their engines still break down, the fault doesn’t trigger for several days now, and the damage can be repaired by a skilled enough technician. Many Suzaki have been taking advantage of this change in their convoy choices. The MK.I or Planetary Gate is the biggest and will allow large groups of people and equipment to move through it at once. The drawback is it takes at least five Web Guides to open such a Gate. Most of the core human worlds back in the Origo Galaxy have this class of Gate, and huge cities inevitably grew up around them. It was typical of a planetary government to build a portcullis of sorts on the Gate to bar any unwanted entry. With these Gates, it was common for land trains to transport goods and passengers between worlds. Web Guides acted as pilots when driving the trains, and most were either operated under the banner of the Imperial Wainwrights Guild or were military vessels. The most famous of these was an Imperial train called the Forlorn Hope. It was a huge, armored monstrosity bristling with Sclera Discharge Cannons and rocket tubes and was always the first through a Gate during a planetary siege. The Forlorn Hope had been patched up and rebuilt again and again for over one-thousand years, some say even longer. To have been included in the roster of its Breach Marines was considered a great honor prior to its destruction in the war with the Thinking Machines. An MK.II or Domain Gate is roughly half the size of the MK.I and is often found on more rural worlds. Planets with unusual climates or dangerous flora and fauna are common for this Gate type. MK.II Gates were typical of the Tribe planets and a few of the Fringer worlds in Origo. It takes at least three Web Guides to open this type of Gate. The largest vehicle built that could safely pass through the MK.II Gates were fighters called “Wasps.” The Imperium and Tribes frequently used Wasps during wars in times past, and many movies, books, and television shows about Wasp-fighter Aces are popular among both races. MK.III or Gloom Gates almost always lead to near uninhabitable worlds. These Gates are small, allowing maybe three men abreast to move through at a time. 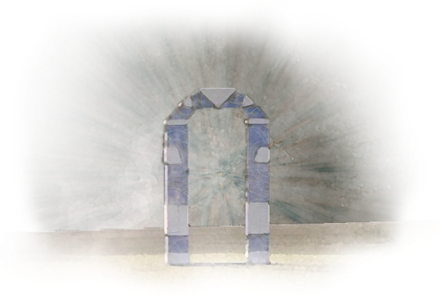 Most of the Fringer worlds in the Origo Galaxy were this class of Gate. It is extremely rare but not unknown for some lush and beautiful worlds to have this type of Gate structure as well, thus leading to the belief that whoever built the Web Way had hideaway worlds for luxury and private estates. These luxury worlds are very, very rare and only four or so have ever been discovered. Eclipse is the only known planet to host more than one Gate; both of which are MK.III Gates.